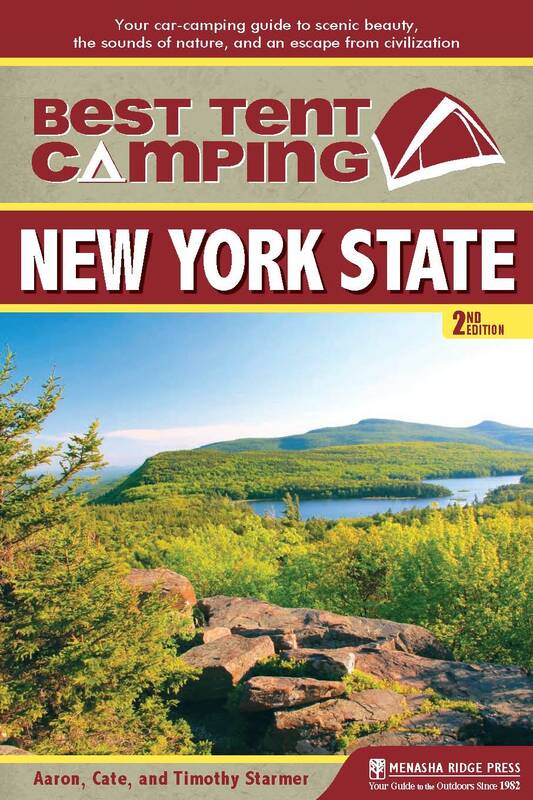 Best Tent Camping: New York State will release its 2nd edition in October, from Menasha Ridge Press. Leaves are starting to change and temperatures are starting to drop here in New York. For some, that means a retreat indoors for the winter. But for many New Yorkers, it means some of the year’s best camping is close at hand. “From the Great Lakes to the Atlantic Ocean, from the Adirondack Mountains to the Catskills, from the St. Lawrence River to the Hudson, tent campers in New York have one of the country’s best selections to choose from” says Aaron Starmer, co-author of Best in Tent Camping: New York, now in its second edition from Menasha Ridge Press. Starmer, along with co-authors Cate and Timothy Starmer, attributes New York’s outdoor wealth primarily to the 6-million-acre Adirondack Park and Forest Preserve, a green space that covers one-fifth of the state. But it’s more than just the Adirondacks. Because state-owned “forever wild” forests all over the state are interspersed with private lands, “New York is perfect for tent campers, as the wilderness surrounds you, but supplies and other recreational opportunities always remain nearby,” explains Cate Starmer. The Starmers’ new camping guide demonstrates the wide reach and variety of New York’s camping resources, from the mountainous Adirondacks and the Catskills, to the human history of the Leatherstocking region, to the Finger Lakes to Long Island, Thousand Islands, and western state for the water-loving campers. The authors have combed through the thousands of New York campgrounds to find the 50 best, rating them by beauty, privacy, quiet, cleanliness, security, and spaciousness. If you are a New York state resident 62 or older on any weekday (except holidays) you can obtain free vehicle access to state parks and arboretums. Simply present your current valid NYS Driver’s License. This policy applies both to Office of Parks and Recreation and DEC facilities. 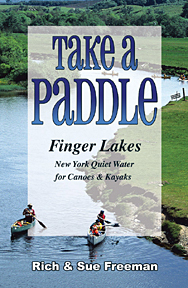 Click here to watch a video & read “Fair Haven Beach State Park.” Then pick up a copy of “Take A Paddle – Finger Lakes” and paddle Sterling Valley Creek and end at Sterling Pond in Fair Haven Beach State Park. Here is a first report on the comments received in the Finch / New State Lands classification hearings, following acquisition and analysis of some 5,000 pages of written comments obtained through a FOIA request. The decision over how to manage the new state lands has been called one of the most important decisions since the founding of the Adirondack Park Agency in the early 1970s. There is a lot of good fodder. NY State Parks has begun offering a longer-term camping option at Max V Shaul State Park in Schoharie County. In the 179 NY State Park system, this is only the third Park that offers this opportunity. This is the first park in the Saratoga / Capital / Hudson Valley and Taconic regions that this is being offered. Seasonal camping reservations must be made with the park directly at 518.827.4711. The only other state park locations in the state that offer longer term camping are in our Central Region – Bowman Lake and Oquaga Lake. If you are unfamiliar – Max V. Shaul is a quiet setting with wooded sites. Highlights at the park include fishing in the Schoharie Creek, hiking the park’s nature trails, enjoying shady picnic grounds, open playing fields and a playground. Additionally, campers have free vehicle access to nearby Mine Kill State Park which offers an Olympic size swimming pool, multi-use trails, boating by permit and views of the scenic 80-foot Mine Kill Falls.